* NuTone was created to mimic the extraordinary sound of authentic tortoiseshell. * Its unique composition produces a punchy bass with clear treble tones, making it a perfect pick for acoustic play. * Its natural lubrication releases off your strings quickly and gives you the ability to produce articulate tones. * Made from polymerizing an animal protein, it is much the same as the famed, but endangered, Hawksbill Sea Turtle's shell. 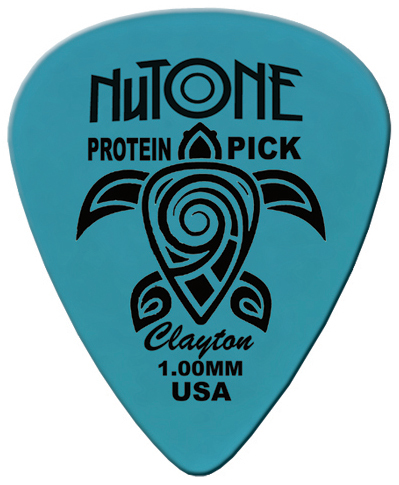 * NuTone Protein Picks replicate the sound and feel of the Hawksbill's shell with its natural protein components, but no animals are harmed in any way by its production.